Nice interview! She makes a great deal of sense. Thanks, Cork, for your comments on this very interesting omnivore/writer & ex-vegan. I had a chance to see her in Nevada City at the Methodist Church and missed her. Friends who saw her were much favorably impressed. 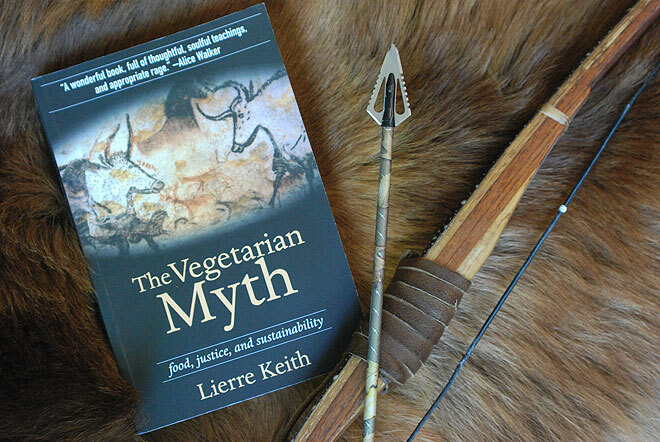 So I appriciate your interview s & summary of the Vegtarian Myth high points. I look forward to looking at her work in depth. Your comments were most interesting. I look forward to getting to know both you and Lierre Keith better! Your stereo-typing ignorant statement “every strict vegetarian, especially one whose personal identity is labeled “Vegetarian” has always had an angry quality about them” is offensive and false. The healthiest type of diet varies for each of us. In my case, becoming Vegetarian actually helped clear up many health issues that medical doctors were unable to figure out. People often ask how I look so much younger than my actual age and I attribute it to my diet and lifestyle. I feel an over-whelming empathy for the plight of animals but I don’t preach to anyone and I do my best to live in peace with all. My father was a farmer and hunter with a heathy respect for life. I don’t have a huge problem with small scale farms that treat their animals with proper care. I even still buy eggs from local farmers where I know conditions are decent. However, I am outraged about factory farming methods!